The Constitution and Canons Committee of the Episcopal Diocese of Fort Worth is soliciting input from the people of the diocese on revisions to the diocesan constitution and canons. The Canons of the Episcopal Diocese of Fort Worth, effective as of November 3, 2012, as approved by vote of the Annual Convention of the Diocese. 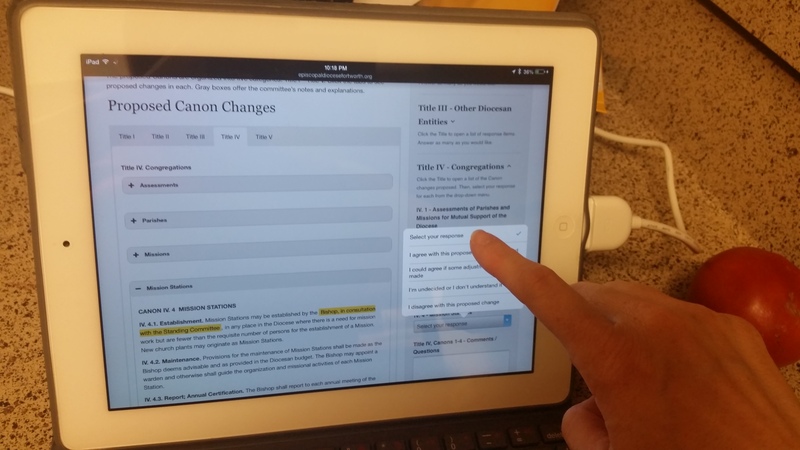 Click here to download the Canons of the Episcopal Diocese of Fort Worth. The Rules of Procedure of the Episcopal Diocese of Fort Worth, effective as of November 2, 2012, as approved by vote of the Annual Convention of the Diocese. Click here to download the Rules of Procedure for the Episcopal Diocese of Fort Worth. Note: The document originally posted in December 2012 was modified to add subparagraph numbers in paragraph 13 and to correct errors in the document title. A subsequent revision corrected the year that the rules were effective.